Lyceum of the Philippines Culinary Institute (LPUCI) sends off fresh and young talents to compete in one of Asia's toughest culinary competition, the Hong Kong International Culinary Classic. The esteemed culinary battle will be part of the 16th International Exhibition of Food & Drink, Hotel, Restaurant & Foodservice Equipment, and Supplies & Services known as HOFEX 2015. 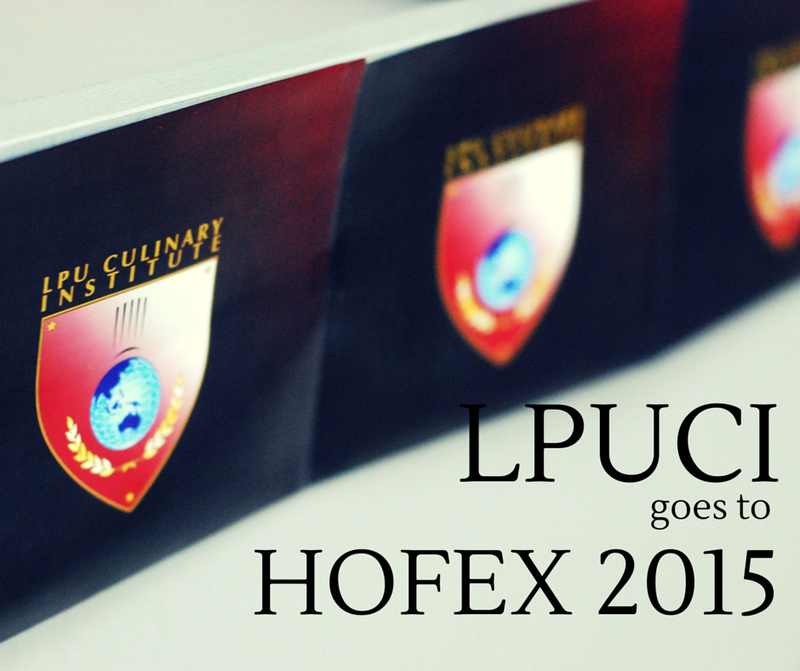 This year, LPUCI aims to bring home honor and a sense of pride to a new batch of LPUCI and LPU students. Chef Dan Basilio, the Culinary Director of LPUCI believes that the program they offer at LPUCI can mold students to be capable to challenge other culinary practitioners not only in Asia, but of the world. LPUCI integrate within their programs not only the latest information and techniques but also with state-of-the-art facilities and equipment. "Students at LPUCI are able to master the use of equipment used and facilitated worldwide," shared Chef Dan. "We believe by allowing the students to be exposed to these type of kitchen set-up where they can practice their techniques learned through lectures and seminars boosts their self-esteem in the process." LPU CI will send Angelique Chua, Emareene Francisco, Ban Vill Villaruel, Janemar Gyle Gicana, Jolina Dela Cruz, and Paul Lyndon Fornoles bannered by Chef Winnie Wong, Chef Kazzie Sy and Chef Clyden San Pedro from the faculty pool to the 2015 HKICC with much confidence and regard. These students, however, do not take the competition very lightly. They had weeks and weeks of preparation and practice being supervised by a pool of LPUCI's well-regarded faculty of chefs. But most importantly, the representatives are given final briefing on how to take on tasks and be able to face even the most difficult challenges they may encounter in Hong Kong. "We have to note the fact that these students are first-timers when it comes to culinary competitions abroad," Chef Dan admitted. "And their being 'fresh' is what makes them motivated and driven to win." It is in fact a tradition of LPUCI to send raw talents to culinary competitions such as the HKICC. This is to provide opportunities to as many students that show extraordinary talents, skills and performances. But LPUCI along with Lyceum of the Philippines (LPU) as a team is not a fresh face to enter the competition though. In fact, back in 2013, four of the representatives sent off to compete were able to bring home awards and distinctions. These admired individuals were Bernard Mayo (Bronze; Hot Cooking U25 Apprentices: Beef Short Ribs), Redentor Agustin (Bronze; Display-Finger Food), and Carlo Licher Reyes (Silver; Professional Sous vide Cook - Chicken). To learn more about LPUCI, you may visit their website at www.lpuculinary.edu.ph or visit their office and campus at Victoria corner Muralla Streets, Intramuros, Manila. For inquiries, contact +632 318 4000 or email info@lpuculinary.edu.ph or marketing@lpuculinary.edu.ph.